A banner and business cards are musts when it comes to ensuring your booth is noticed at large trade shows and other events, but why stop there? 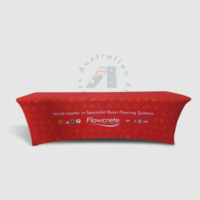 By adding a table cover to your arsenal, you can provide your brand with even more exposure as people walk by. We offer many different tablecloths at Australian Flag Makers, but none are as professional and clean-looking as our fitted elastic table covers. 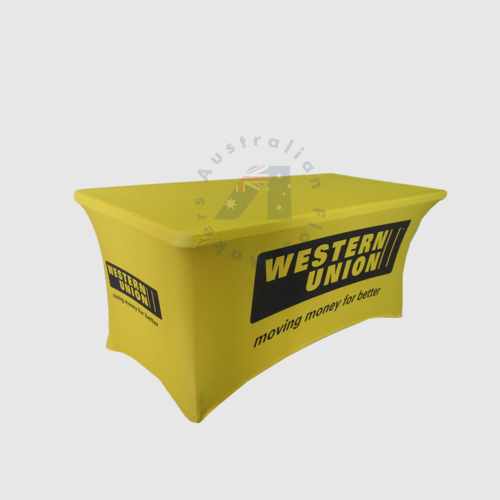 They provide a modern look to your table while providing you with another way to display your logo, and because they conform to the shape of the table, they are the perfect choice in small spaces and at outdoor events. Even though our fitted elastic table covers conform to the size of the table, they still provide an excellent opportunity for storage. If you’d like to hide boxes and other items out of sight, choose a back with a zipper. Are you looking for plain coloured stretch table covers with no print? 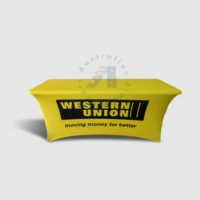 Click here for prices. 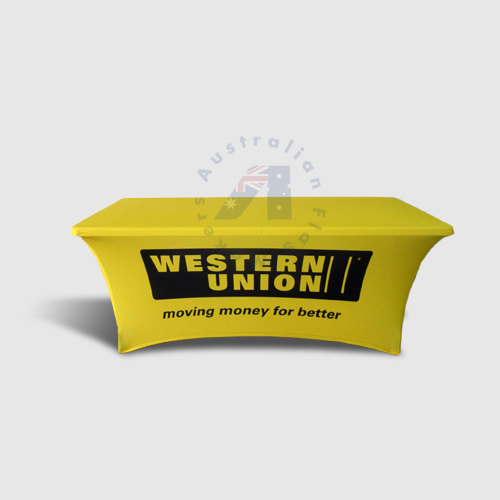 Need a little extra leg room? 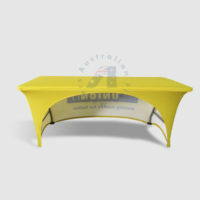 Choose a cover with a hollowed-out back. 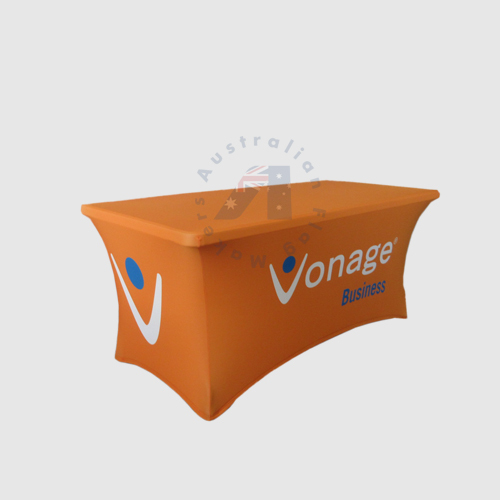 This table cover can also provide you with storage, as long as customers won’t be walking around the backside of the table. If you want customers to be able to walk all the way around the table, choose the standard fitted elastic table cover with an enclosed back. A tablecloth isn’t any good if you have to work hard to maintain it. 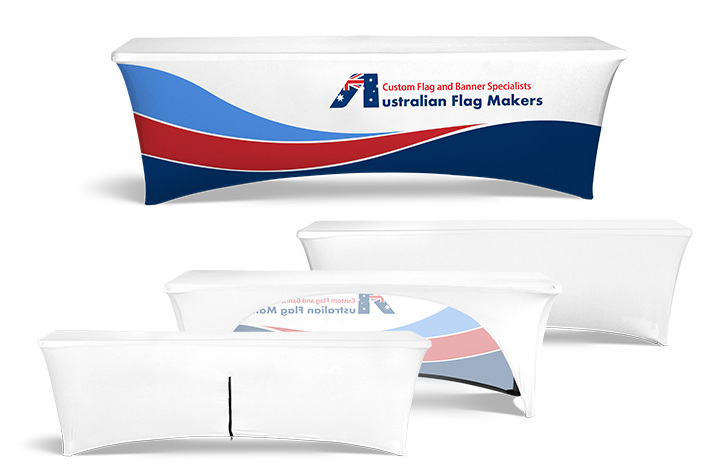 The covers at Australian Flag Makers are easy to use and require very little upkeep. They are wrinkle resistant, so they can be used right out of the box, and they’re waterproof, so they’re easy to wipe clean. 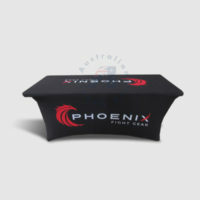 We can customize a fitted elastic table cover just for you! Contact us today to get started!